Here's a nice photo of Farmer Joe at his recent birthday party on the farm! Thanks to Lewis Tennenbaum for sending this our way. Want to see your photos featured in this weekly email? Just snap a pic -- from the farm, from your CSA share itself, or even a recipe you make with your Clagett produce -- and either email it to us or post it to Instagram with the hashtag #ClagettFarm! Welcome to the first week of the 2018 season! Need any reminders of how the share pickups work? Here's everything you need to know. So what about strawberries? We've gotten a handful of questions about the strawberry forecast at the farm. We are sad to say that we had a strong crop of strawberries, but they have been decimated by deer. We have already planted a new field which will produce for next season, and we're working on a fence to protect them. We are as disappointed as you in our lack of strawberries. Onward! In addition to the vegetables we harvest and deliver for the CSA shares, each week we'll let you know the items that are available for you to pick in unlimited quantities out at the farm. This week that includes: garlic chives, thyme, oregano, sage, sorrel, onion chives (edible flowers), stinging nettle (Be sure to wear gloves, sleeves, pants and closed-toed shoes!). For a limited time only, we're offering home-grown honey produced by local beekeeper artisans! One of our CSA members, Clark Reed, has some bee hives in his yard in Rockville, Maryland. He has made Autrian Gold honey, produced from Black Locust and Tulip Poplar trees. We'll be selling the honey at the CSA pick-ups. The jars are $10 per one-pound jar of honey -- $1 of each jar benefits Clagett Farm. Bring your cash or check to the pick up if you would like to buy some over the next month or so.We'll keep you updated on how many jars are left. Fun fact: How many flower visits = one pound of honey? One million! 3/4 pound greens including choices of arugula, kale, spicy mix, tatsoi, purple mezuna, tender greens, and Southern Giant. 2 1/2 pounds total combination winter squash (small quantity), tomatoes, peppers, summer squash and beans. 5 1/2 pound total combination turnips, radishes, potatoes and eggplant. Greens! Almost all the greens except the kale are on the u-pick list. Tomatoes -- still available, though there are not many of them. Lots of green tomatoes. Ground cherries. They're sweet and still a good amount of them. Celery. The celery is too tough to eat raw, but it's great for cooking. There is lots of it -- pick it and make stock! Swiss Chard. It will improve as the weather cools. Beans are in two fields as of this week. Lots in C1. The ones in B3 are more suitable for shell beans. Okra -- there's lots of okra right now. Come and pick it! Especially on a Monday or a Friday -- we want you to pick it and enjoy it. Herbs: Basil (in the high tunnel). Plus Oregano, sorrel, parsley, onion chives, coriander, dill seed, stevia, lemongrass, anise, Mexican sour cucumbers, thyme, lemon balm, sage, garlic chives. As always, any flowers are always fair game. There are a lot of nice flowers on the farm right now. Lots more greens on the way, including more kale. Bok choy will be ready next week. This week is likely the last of the summer squash. This is also the last week of the potatoes. Enjoy this week's share, and let us know if you have any questions about your produce or how to use it! With a healthy dose of turnips in this week's share, I thought it might be useful to share with some you some ideas for how to use them in the summer months -- particularly, recipes that don't require long periods of roasting or stewing. With that, here are six ideas for using turnips in the summer! Raw, in salads -- Slice them thinly and add them to salads uncooked, just as you would a radish. Pickled turnips -- Make some quick-pickled turnips and eat them on their own or on sandwiches. Turnip Kimchi -- This is another take on pickled turnips with slightly different flavors. Turnip and Kholrabi Slaw -- We made this a few years ago and loved it. Japanese Turnips with Miso -- Requires more cooking than the recipes above, but looks delicious. Grilled Turnips with Garlic -- Simple and tasty. Do you have a favorite use for turnips when it's warm? Share them here in the comments! Of all the items currently in the CSA share, I suspect that Garlic Scallions -- a whole pound this week -- may be the most difficult for some of you to use. Hopefully these ideas will help you find ways to use them in your cooking. 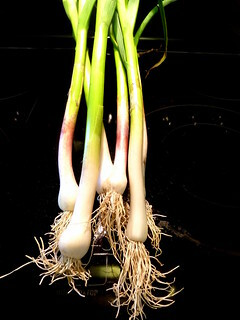 First, a tip on searching for recipes: Look for anything that includes "garlic scallions" or "green garlic." The two terms are interchangeable. Roasted Lemon and Garlic Scallion Herb Pesto -- This is a recipe from this blog, way back in 2006! Spinach and Green Garlic Souffle -- From Epicurious.com. Asparagus With Green Garlic -- From NYTimes.com. Quinoa Pilaf with Sweet Peas and Green Garlic -- From today's NYTimes.com. Asparagus could be substituted for the peas here. Grilled, with a mustard sauce -- Last week, we used our garlic scallions by marinating them in some soy sauce, grilling them for a few minutes until they had a nice, light char, and then served them with a mustard sauce. You can see a very simliar recipe for Charred Spring Onions with Mustard Cream Sauce on our blog. Other ideas for using garlic scallions? Please leave them in a comment! With only a brief appearance in the share, you'll no doubt want to make the most of these squash. Here are a few ideas for how to use winter squash, be it from the share or another source this winter. Split 'em across the middle, scoop out the seeds, shave off the top and bottom so the two halves can sit upright. Then slather each half with a little salt, add a pat of butter and a glug of maple syrup, and bake for about 45 minutes at 350 degrees. Stuffed Acorn Squashes -- This version incorporates meat, but you could easily make it vegetarian. Acorn Squash Soup with Kale -- This uses two ingredients found in this week's share. Acorn Squash Puree -- This method could be used for butternut as well. And here are a few ideas for using butternut squash. We've loved this Butternut Squash Risotto, which we've made a number of times. Butternut and Apple Soup -- As temps drop, it's time for soup! Twiced-Baked Butternut Squash -- A nice substitution for potatoes. Pasta with Butternut Squash and Pecans -- A nice-looking vegetarian pasta. Do you have a favorite winter squash recipe? Please share it here! In preparation for this CSA season, we did a little tidying up here on the blog. Chiefly, we cleaned up the categories in which the posts are filed, condensing the main topics into a handful of items (like This Week's Share). We also built out categories for recipe related posts. So you'll find, on the lefthand side of the blog, a listing of recipes for everything from arugula to zucchini. Chinese Cabbage Stir-Fry with Rice Noodles, Pork, and Cilantro (via MarthaStewart.com). This could be made vegetarian by omitting the pork and substituting the fish sauce with soy sauce or mirin. Also, we would love to feature photos and recipes submitted by CSA members this year on the blog. If you snap a photo with your phone or run across a recipe that you like, shoot it to me in an email! We'll be looking for ideas to share all season long.